Kenneth E. Bisbing, Jr. 53, of Manhattan Beach, CA passed away while on a fishing trip in Canada in 1992. Kenneth was a major participant/leader in all activities involving youth in Manhatten Beach. Kenneth was awarded "Citizen of the Year" for his dedication to the youth activities in Manhattan Beach. During the Christmas season Kenneth would dress as Sants Claus and would visit schools, community events and charities delivering food and gifts. Kenneth enjoyed woodworking, canoeing and camping. He took many trips to the wilderness of Alaska and Canada. It was on one of these trips that an unfortunate accident occured and Kenneth drowned. 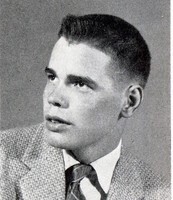 Kennith served his country in the United States Marines from 1956 - 1960. Kenneth is survived by a son Kenneth E. Bisbing III; two daughters Gretchen Bisbing-Hoefler and Genevieve Bisbing-Cass; two grandsons Kenneth E. Bisbing IV, johann Cass Bisbing and two granddaughters britha Gretchen Cass and Grete K. Cass.